Local dishes in Cambodia like this remind you of Asian food in general. Yet dishes like Cambodian Saraman are also more punchy, with often less sauce, the use of bread and the staple of rice. Stir this dish regularly to ensure the sauce thickens well and flavour intensifies without sticking to the pan… this dish uses the Kroeung curry paste that you can find in our book, which contains a lot more details and pictures on how to achieve the best and most authentic flavour. The basics to any curry like Cambodian Saraman and the most important part is the paste. Using fresh ingredients is equally crucial, as is the pounding process to release all the juices fully to combine. After this is produced you can make the majority of Cambodian or Khmer dishes. Over a low heat fry the beef in a pot with half the oil for 5 minutes until it turns semi-dry and is cooked through. Remove from the pan and leave to one side. 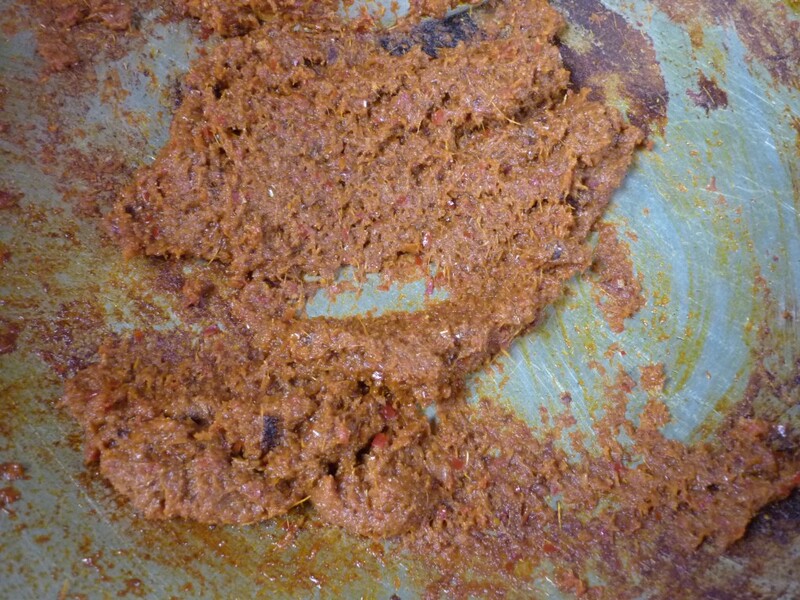 In the same pot fry the kroeung paste with the shrimp paste over a medium heat with the remaining oil for 5 minutes. Add a dash of water to ‘Deglaze’ the bottom of the pan. Scrape the pan lightly and stir well to remove the flavour before adding half the coconut milk. Immediately add the beef and cook over a low heat for 15 minutes. In the meantime roast the peanuts in a dry frying pan, until they start to turn brown. Remove from the heat and grind until it becomes a powder that still has chunks in. Add the peanuts, whole onions, fish sauce, sugar and salt to the pot with the remaining coconut milk and cook the Saraman for a further 20- 25 minutes or until the sauce thickens. Remove the onions from the pot and ladle into bowls, with rice or plenty of baguette on the side to soak up the delicious sauce.